Dental work isn’t performed in a vacuum — the state of your general health can have an impact on procedures and vice-versa. This is especially true if you’re taking certain medications like blood thinners. Blood thinners such as Warfarin or Clopidogrel are used for a number of medical conditions as an anti-coagulant (inhibiting blood from clotting). They’re commonly part of a stroke or heart attack prevention strategy in patients with cardiovascular disease, or those with tendencies for thrombosis (blood clot formation within blood vessels) or pulmonary embolisms (blood clots within the lungs). They’re also used with patients with artificial heart valves or on a temporary basis with patients who’ve recently undergone knee replacement or similar surgical procedures. In most cases, dental work won’t be affected by your use of a blood thinner. An issue might arise, however, if an invasive procedure has the potential to cause bleeding, like a tooth extraction or gum surgery. Because the blood doesn’t clot normally it may be difficult to stop the bleeding during such procedures. 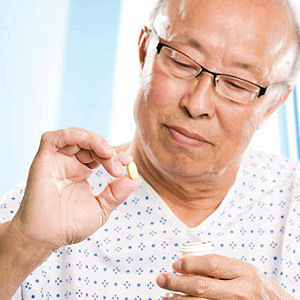 To avoid undue complications, it’s always best to let your dentist or oral surgeon know what medications you’re taking, especially blood thinners (this includes low-dose aspirin, a common over-the-counter drug that’s often prescribed as a mild blood thinner). Depending on the procedure and your dosage, they may consult with your prescribing doctor to see if temporarily stopping the medication or reducing the dosage is an acceptable precautionary measure for your dental treatment. Your dentist may also take precautions during the procedure to help reduce bleeding such as using haemostatic agents around the wound site to help stabilize blood clotting, while carefully suturing the wound to avoid disrupting smaller blood vessels (capillaries) that easily bleed. If your dosage has been temporarily stopped or reduced, you’ll usually be able to resume blood thinners immediately after the dental procedure. Working together, your dentist and doctor will help ensure that your health won’t be at risk and your dental procedure will occur without undue complications.